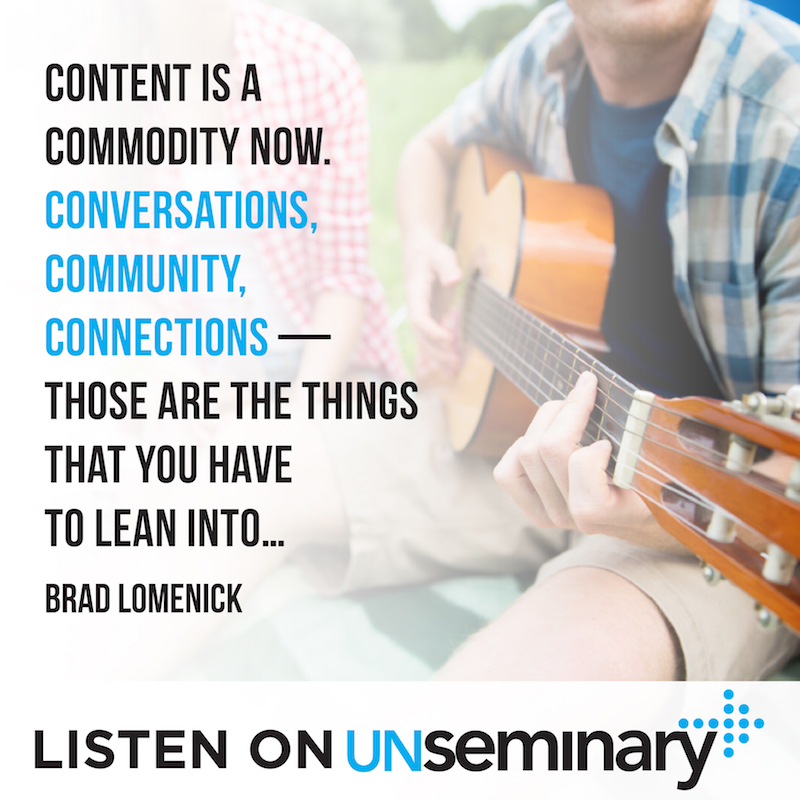 Thanks so much for joining us today for this episode of the unSeminary podcast. We’re absolutely honored to have Brad Lomenick with us today. Brad is one of those guys who knows everyone, so you’ve probably heard of him or seen him a time or two. He spent 12 years leading the Catalyst Movement. Currently he’s an author as well as a consultant and speaker for Blinc Consulting. Brad grew up in Oklahoma and majored in history in college. He thought he’d go to law school, but then spent 5 years on a ranch in Colorado. Those years taught him about teamwork and being a part of something bigger than himself. He joined with a consulting firm after his time on the ranch and one of their clients was INJOY, John Maxwell’s organization. Brad learned a lot working first as a consultant for INJOY and then working with them directly. God turned his life around from what he had originally expected, but he’s grown over the years into consulting and teaching leadership. 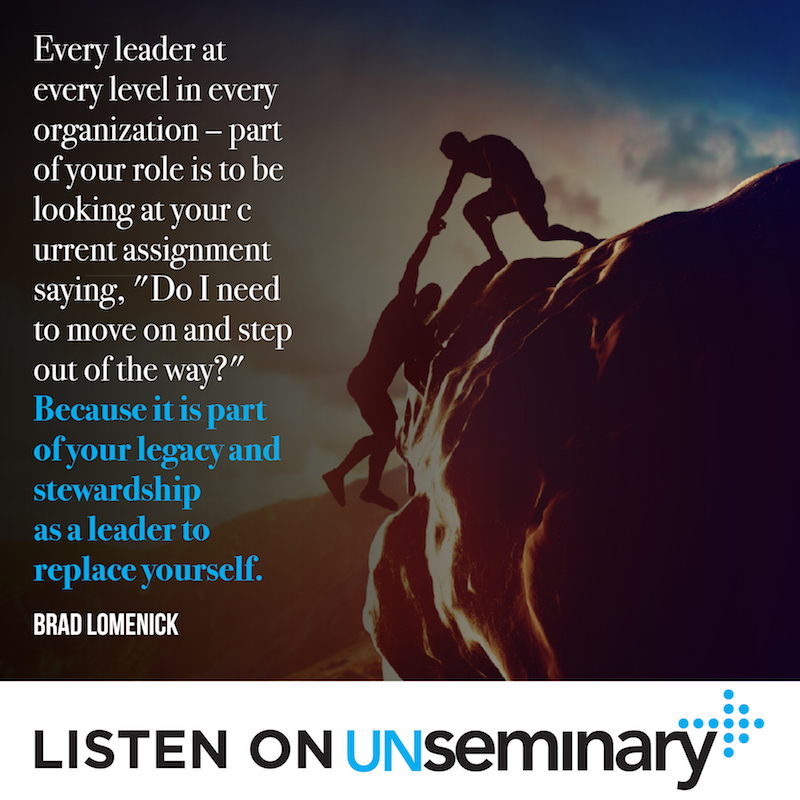 Today, Brad talks with us about taking advantage of leadership development opportunities at conferences as well as raising up new leaders to take your place. Experience a conference with your team. // “I don’t say that as someone trying to get more registrations,” Brad says. “The shared experience is what you bring back that has the most value and is the most memorable.” Although most people won’t remember who spoke or what happened while actually at the conference, the conversations and experiences with their team are the most powerful. Ask yourself, “Do I need to step out of the way?” // In speaking about his choice to step down from his position at Catalyst, Brad explains: “Every leader at every level in every organization – part of your role is to be looking at your current assignment saying, ‘Do I need to move on and step out of the way?’ Because it is part of your legacy and stewardship as a leader to replace yourself.” What are opportunities that only you can do? Examine your current role and see what you can hand off to empower the people who will take the baton after you. You can learn more about Brad and his book H3 LEADERSHIP: Be Humble. Stay Hungry. Always Hustle. at his website www.bradlomenick.com. 00:40 // Rich introduces Brad Lomenick and welcomes him to the show. 01:44 // Brad tells us his story. 06:15 // Rich shares his experience of Catalyst. 08:00 // Brad tells us how to extract the most out of conferences and events. 12:20 // Brad talks about creating our own customized experiences. 13:58 // Brad tells us why they focus on creating fun at Catalyst. 16:27 // Rich shares how they create fun at his church. 19:34 // Brad talks about his decision to transition from Catalyst. 25:00 // Brad talks about the importance of planning for a successor in leadership. 26:20 // Brad and Rich discuss Brad’s Book, H3 Leadership. 30:50 // Brad offers his contact details. 31:22 // Brad finishes by encouraging the listeners to stay faithful. Rich – Well hey everybody, welcome to the unSeminary podcast, my name’s Rich Birch, the host around these parts. I am so glad that you have decided to spend some time with us today, we know that you’ve got a lot going on and we say this all the time, we know that you’ve got a lot going on at your church, but it’s true and we’re just honored that you would take some time out today, pop us in your earbuds and listen in to today’s conversation. 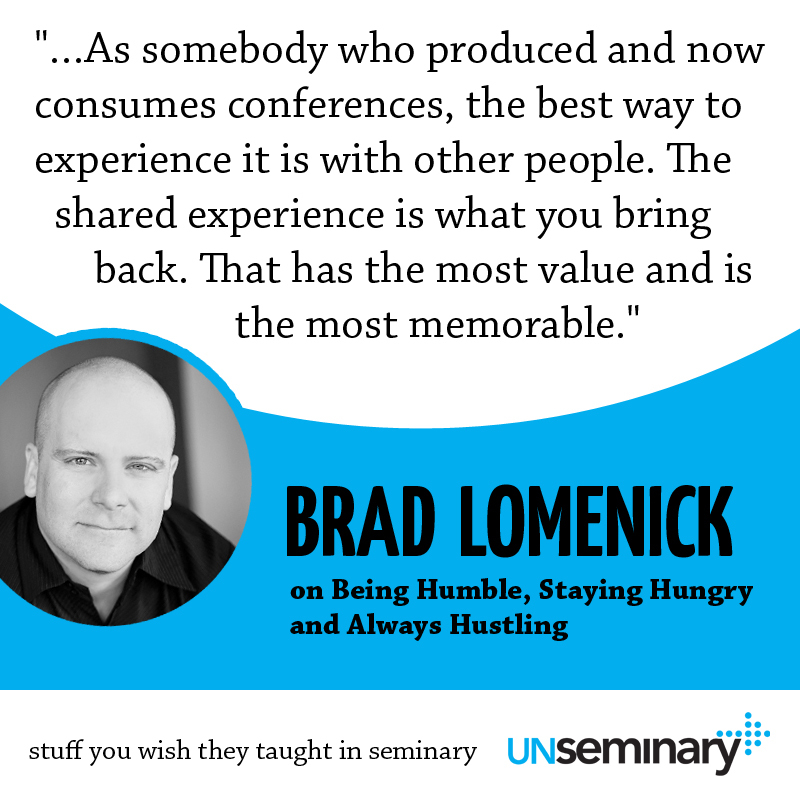 I’m really honored to have today’s guest, Brad Lomenick with us. Brad’s a fantastic leader, he’s one of those guys that knows everybody, you can’t ever seem to get away from him. He spent 12 years leading The Catalyst Movement, which you may be familiar with the Catalyst Conference or the Catalyst One Day, really a movement of emerging leaders. Currently he’s the founder of an organization called Blinc, he’s a leadership consultant speaker, he’s the author of a great book that I want to make sure you learn a little bit more about but Brad, welcome to the show. Brad – Thank you rich, awesome to be on Man. Rich – I’m so glad you’re here. Brad – I’m a first time caller but long time listener. Rich – Nice, that’s great. Well here we are, spinning the Stax of Wax, taking requests from Brad. Brad – That’s right, if you have a second life, if you want an ultimate career you could be a radio host. I’m telling you. Brad – You’ve got the voice for it. Rich – Oh nice, I’ve got the face for it too, so that’s a good thing. Brad – Listen, you and I both. We’ve got the hair for it. Rich – Yeah, absolutely. Well Brad, why don’t you kind of give people the Brad story? I know that’s really hard but kind of compress down, give us a bit of your background, tell us a little bit about who you are. Brad – Yeah. Oklahoma born. I grew up outside of Tulsa, a little town called Bristow. I went to school at the University of Oklahoma. So we are the only team this year, in the college athletic world, that got two teams into the final four. Brad – Now we didn’t do much once we got there, but football and basketball, we both had teams in the final four. Brad – So you know, like hey, we’re little out-coast in the middle of nowhere in Oklahoma that’s doing great things. Brad – I was a history major in college, which is pretty much worthless. Brad – Yes, I think I was just anti everything else, so I just decided that I liked history. I graduated, thought I was going to go to law school and then went and spent five years on a ranch in Colorado and that was like these formative years of work ethic and work theology and understanding the idea of, what does it mean to actually be in the middle of an organization and learn how to lead and deal with people? But it was a total like 90 degree turn of what I thought God had sort of planned for my life, which was to be in politics and to sort of be in the middle of that world of culture. So after working on this ranch and riding horses and wearing Wranglers and playing cowboy, truly like I was a cowboy. Brad – I ended up connecting with a couple of guys who had a small consulting firm and went and joined up with them. I knew nothing about consulting, I knew nothing about management stuff, I was a history major and then worked on a ranch riding horses. Rich – Right, there’s a logical connection there, between that and consulting. Brad – Yeah exactly. One of our clients at the time, this was like the late ‘90s, one of our clients was an organization called INJOY, which if anybody follows John Maxwell, they know that that was his original organization. So I got involved with John and just the more I got connected into that world, first as a consultant, then second as a sort of much more involved free agent and then third as a fulltime employee, I got connected with Catalyst and will all of the events and Simulcast and leadership stuff John was doing. So really my teeth have been cut for the last 16 years, 17 years on being around the organization that John created and there’s been several manifestations of that and there’s been lots of different expressions of it. But I feel like my leadership heritage and the things I’ve learned about leadership have been really swimming in the pool and being in the slipstream of John Maxwell. So obviously Catalyst for me was a huge part of that story and the last year and a half, we can talk more about this, but I stepped out of leading Catalyst and now I’m basically unemployed, that’s what I tell people. I don’t really have a job, although I have my own little thing and I do a lot of advising and consulting. It’s great, you know, Atlanta’s home, Passion City Church is home church, so I spend a lot of time and energy and bandwidth and a lot of my sort of emotional and spiritual capital is invested… well a lot of my spiritual capital is invested in the house and Passion City Church. So that’s obviously a really small movement. The Passion Conference, they’re not doing everything, so I get to play in lots of different sandboxes. I’m not married, I’m the most eligible bachelor in all of Christianity. Rich – Nice, great. Check out bradlomenick.com if you’re interested. Brad – Right, yeah. I feel like I should be like the spokesperson for eHarmony, like I’m that guy. Rich – You’re that guy, nice. Brad – You know, it just never happened for me. It’s given me a lot of opportunities to do other things in life, but yeah, that’s my Reader’s Digest version. Rich – I appreciate that Brad, as someone who’s benefited, before I knew you, has benefited from your ministry through Catalyst, I just say thank you for your years of leadership, just incredibly influential, I’m just so thankful for this. Brad – You’re the poster boy. Brad – Yeah, well you probably had your cool bag. Rich – Saddlebag or whatever. Brad – Yeah and had a triple bottom line cause tied to it and you had your hipster glasses on. Brad – I like to call my style Rich, you’ll appreciate this because you and I are probably the same level of style, which is the classic hipster. Brad – That’s what I want to be. I want to be the classic hipster. Brad – I’m not trying too hard, but I can still run with the big boys as relates to fashion. Rich – Yeah, I just can’t have the beard, that’s the problem. Brad – Yeah that’s true, me too, yeah. Rich – Nice. Well you know what, I thought it was kind of interesting, you’ve been on the development side of organizing a lot of events and still really do a bunch of that work, which is great, and a lot of people that listen in, we’re consumers of those kinds of experiences. As someone that leads those types of events, what would you say are some best practices of kind of getting the most out of them? We invest a lot of time, effort, energy, money to go to these kinds of things, how do we extract the most out of them for our ministry and for us personally? Brad – Great question. First would this, go with your team and I don’t say that now as a card carrying Catalyst person that’s trying to get more registrations. I truly say that as somebody who produced and now consumes conferences. The best way to experience it is with other people and your team, the shared experience, many times is what you bring back that has the most value and is the most memorable. Most people don’t remember like who spoke or what happened but they do remember the conversations that are occurring in the van or in the rental car or on the plane ride back or at dinner that night. So that one’s huge. Rich – Publisher, church or whatever, yeah. Brad – Or the other church. I want to meet that other executive pastor, I want to meet that worship leader.” Sometimes we go into it going, “I just want to meet everybody,” and then we meet nobody, because we didn’t really have like a set sense of what would success look like. So figure out who you want to meet and then look for opportunities to build community and what I mean by that is, find those ways that you’re both adding value to other people as well as building your own infrastructure. That could be simply walking… as you said, you were walking around looking at the booths and the organizations there. Well like, don’t just walk around and look at those. Rich – Talk with them. Rich – Just talking, yeah. Brad – Things like Catalyst, things like Leadership Summit, things like any other event you put in there. Rich – Orange Conference, whatever. Brad – Orange Conference, the people who show up are actually leading and trying to get better, so you’ve got this collected energy of a lot of like really high level people. That’s the best thing you can take away. Brad – It’s that sense of, how am I adding to you and how are you adding to me? Obviously the sessions are great, the speakers, the bands, the experience, the program, all that, but that’s not the most authentic/available to you in the sense of only what you can take away. Like, you can go and buy the DVD sets. Brad – Or watch online all the content. Brad – The content is a commodity now. So the conversations, community, connections, those are the things that you have to lean in to and actually make sure you get out of something like that. Rich – It’s so true. I remember years ago, a mutual friend, Carey Nieuwhof, I worked for him for a little bit, we went to a conference together and we had a team of people that we took and I still remember, it was literally that experience. I can’t remember, you know, insert, brand name, pastor said that morning, but that night I still remember, we went out for frozen yoghurt and it was just our team around the circle and it was a really tender conversation and I still, like yeah, that sticks with you right? Those experiences stick with you. Then the same, I’ve said to other folks, you sit down, even in Catalyst, you have thousands of people, you’re going to end up in a row besides some people you don’t know, and you’re probably going to be there early because you’ve got nothing else to do, so say hi to them, like, “Hey, tell me about who you are,” and you’d be amazed, the people you run into and you’re like, ‘Wow, that’s incredible, like you’re just sitting here beside me,” for sure. Brad – I think the lesson is, if you’re going to spend the dollars and the energy to get there, then put in the energy to actually create your own experience. Rich – Yeah, “Do something to me,” yeah. Brad – “You connect me,” and conference people, anybody that puts on events, the greatest pain point that most conference organizers feel is that I’m not actually connecting people, like I’m not actually creating community, even though you’ll talk about it and it looks good on a marketing brochure. Most conferences are awful at creating community because the easiest thing to do as a conference organizer is to produce content. Brad – That is the thing that is the lowest barrier to entry. So it’s up to you many times, as the attendee, to actually like put more energy into creating your own sense of, my shared customized experience, that I walk away and go, “Wow, I met five people who are going to be friends now for the next ten years and I’m going to be able to learn from them.” So that’s crucial. Rich – When you were producing Catalyst in the early days, it seems like you led the way, at least in the Christian market. There was obviously, you’d got music, you’d got speakers, there was kind of the stuff you would say is typical programming, but then at least Catalyst was the first place I’d been where there was like games in the lobby and like goofy stuff going on out in front of the arena. Was that a part of what was driving some of that thinking like, “We’ve got to get people kind of doing stuff active together,” was that what was going on there? Rich – Yes that’s very true. Brad – The reason for that was a couple of things. One, we wanted to create margin. Brad – Because we know, as leaders and as conference people, we would watch other events, when you had margin in the program you are able to actually retain more knowledge and content because you’re giving your brain the opportunity to be amused. Like a lot of events you go to it just like serious, serious, serious, serious, serious, serious, serious. Brad – So we wanted to create those margin moments because it actually helps you retain better. Secondly, it’s just more fun. Why are we getting rid of humor of fun of experiences and shared experiences, breaking world records, having games in the lobby, like creating an environment where people are actually doing something as row or as a room, the idea that there’s funny? Like we were always prodding ourselves on let’s make sure we have elements of humor. Brad – Because humor is actually creating margin but here’s what it also does Rich, which this was so important to us, it was that we were taking away any sense, at an event like Catalyst, that there was somebody in the room who was more important than somebody else. Brad – Foyer fun, I like that. Rich – Yeah to kind of move our experiences out into the foyer and the way I’ve described it for our own team is, we want to speedbump as people come and go that we want to deliberately slow people down, we want to be inefficient. So we’ve done all kinds of crazy stuff, this last Christmas we did a whole Star Wars theme thing, which I thought every church in the country was going to do, but people didn’t. So we had like Darth Vader one week in the foyers, we had Chewbacca, we spent all this money on costumes and it was just fun moments. Brad – Oh that’s awesome. Rich – It was fun, really just trying to learn off of events like Catalysts and other experiences like that. Trying to slow people down like, “Hey, it’s okay, let’s have some fun,” hopefully reinforce where we’re going today. You don’t have to wait until they’re sitting down and the countdown clock is done. You know, jump into the experience for sure. Brad – I think for leaders listening and watching… are they watching this or are they just listening? Rich – Yeah some people watch. Brad – Okay, but I think what you want to always think is, the more serious we have to go, in a sense of the more deep we’re going to dive, the more willing you have to be to let people have time to breathe and have moments of margin. Brad – Sometimes we think just the opposite, like the more serious it is, the less we have to create humor and I would say just the opposite, because people want to see that, again you’re real, you’re personal, you’re human, you’re authentic, you’re approachable, you’re vulnerable, like all of those things, that’s the pain point that people are looking for or at least what they’re experiencing is, “Man if you’re going to tell me something that’s really deep and heavy, I just want to know that you care about me and that you know me enough to allow me to have some fun.” Because that’s the essence of life, nobody lives a boring, mundane, serious life. Brad – Right, what’s the real story? Rich – Going to London for six months or something. Rich – What happened in that transition? Brad – Well I tell people that I Barry Sanders and I like to use Barry Sanders as a verb instead of a noun. “I just Barry Sanders it.” The simple way to say it is, I wanted to step out of the way and get out of the way before people had to tell me to get out of the way. I think transition and succession and legacy and leadership is so important and when I was around in the early days of Catalyst, this was 2000, 2001, Gabe Lyons was there, Gabe was leading Catalyst at that time and now he leads Q and other things. Jeff Shinabarger and Maxwell, there was a circle of people and I was a consultant in the early days and then I got involved. Brad – “I’m still here,” and all the other guys, all the other team that was on the like execution team and on the original team had all moved on to other things, leading great stuff and I just felt like, “You know what, I need to do what we said we were going to do and I need to be that guy that hands this off,” and Catalyst has never and will never be about one personality. If it is about anybody it’s about Andy Stanley and John Maxwell in the early days, but Andy Stanley. Rich – Which is the strength of your leadership, what you built for sure. Brad – Sure and that’s what we wanted to try to do, is to create this thing that was non-personality and nobody cared really who was behind the curtain, pulling the strings. The thing for me too was that there were certain things Rich that I was starting to have opportunities to do that only I could do, in the sense of, as the leader of Catalyst. I was being given seats at other tables and all of a sudden, it wasn’t attention, but it was like, “Man, if I can only do this thing over here, then shouldn’t it be good leadership for me and good legacy for me to start handing off the things that someone else can do?” And over time it was like, you know what, 80%, 75%-80% of my Catalyst world, of leading Catalyst, was hand offable. Brad – So why not hand that off and most of us, when we get there, as you said like, “You’re at the top of your game man, you’re at the pinnacle of your leadership, sort of moment in life. You’re leading something like Catalyst that has got…” I mean, everything was up and to the right. Rich – Yeah right. Absolutely. Brad – A few years ago everything was up and to the right like all the measurable were the best they’d ever been. Rich – Which so many churches find themselves in. Rich – So I think the fact that you’ve done that, to me is super humbling. So that is kind of the, at least the emotional kind of tenor that H3 was written in. Why don’t you give us kind of a sense of what that book’s about and why should people should be reading it? Brad – Yeah thank you. Well just to put a bow on what we were just talking about. Brad – What I’m not saying Rich and for everybody out there who’s hearing this going, “Well wait, does this apply to me?” I’m not saying that that applies to everybody. Brad – I’ve seen lots of leaders who, they’re 30 or 40 years in to the same season and the same role and the same title and the same position and they’re crushing it. But it does mean this, that every level of your organization, every leader at every level and every organization, church non-profit business, part of your role is to be looking at your current assignment saying, “Man do I need to move on and step out of the way?” Because it is part of your legacy and part of your stewardship as a leader to replace yourself. Brad – So anyway, to your question. For me, the premise of H3 is that, I did get to a place in my leadership where I had to recalibrate a little bit, for the next 20 years, 30 years of my journey and say, “What is it? Let me just redefine and make sure I’m clear on what I would say is my leadership mantra.” H3 is Humble, Hungry, Hustle, that’s the 3 Hs, that’s been my leadership mantra, really since I was in my 20s, I didn’t know what to call it. Other people have those 3 Hs, those aren’t mine, but that seem to be the phrase, “Be humble, stay hungry, always hustle,” that permeates out of me on a consistent basis. When the young, whippersnapper interns would show up at Catalyst over the years and they’re 22 and they want to change the world and they say, “Hey Brad, how do you define your leadership?” That’s the way I would define it. Brad – It’s humble, hungry, hustle. So within those three, what I’ve tried to do with this book is both tell my story of transition and as you mentioned, I went to London, I took a sabbatical for six months before making the decision. Part of that whole process, which I don’t want to get into, but there was a pretty significant process for me of, “How do I step out of leading Catalyst?” Because I knew it was time, I could sense that, but then it was like, well how do you actually do that well? Brad – I hope it takes because it will prove that I was the man. Rich – I was the man, exactly. Brad – There’s 20 habits in the book and those 20 habits are, for me, those are like my playbook for the next 30 years of my leadership journey and just trying to make sure that those are instilled into my world, into my leadership. Rich – The checklist, yeah. Rich – And it’s similar with your book. I was just drawn in by your story and then there’s just so much in there that is challenging for me personally. So I really would encourage people to make sure they pick it up. We’ll have a link to it in the show notes and we’ll email it out to people and all that. If people want to get in touch with you, or learn more about kind of what you’re up to, what’s the best way for them to do that? Brad – Just my name and .com. So bradlomenick.com. Brad – Then all of the social media outlets I’m @bradlomenick. I don’t think anybody else has that name. Rich – It’s very easy. Brad – Yeah, I got to have my selection and my choice on first and last name on all the internet outlets of social media-ness. Rich – Yeah that’s great. Brad I’ve really appreciated you being on the show today, we should let you go, I know you’ve got other stuff to get to today. Anything else you want to say before we wrap up? Brad – No. Thanks for what you’re doing, thanks for making these conversations available and I think my encouragement to leaders is, first of all, the place you are right now, listening to this, watching this, a lot of you are frustrated, a lot of you may feel like the dream that you had you haven’t gotten to yet and just be encouraged that God measures you on faithfulness and me carrying the mantel of Catalyst, with thousands of people, was a great season. But man, now I’m carrying the mantel of 10s instead. My influence meter and my impact is more being measured on, how am I impacting the 10, the 20, the 30 people, the 40 people that I’m getting to spend time with and that’s just as important. Like I didn’t go from strength to weakness, I went from strength to strength. So if you’ve got a church of 200, man crush it. Do what you’ve been called to do with that crew. So that would just be my encouragement, be faithful, God’s put you somewhere on purpose, you do matter, you’re making a difference and keep it up. Rich – I really appreciate that Brad. Thanks so much for being on the show today. Brad – Awesome, thanks Rich.